Kabul residents and some watchdogs have slammed government and security forces for allowing Massoud supporters to patrol the streets of the Kabul for hours, largely unchecked, while shooting in the air. Integrity Watch Afghanistan (IWA) said Sunday’s chaos was testimony to the lack of rule of law in the country. "Today's Kabul situation is due to the lack of government and national sovereignty," Nasir Timori, a researcher at IWA said. Terrified residents mostly stayed indoors and shops and businesses through the city remained closed as gunshots rang out for hours across the city. The Public Health Ministry said at least 20 people were wounded in the shooting spree, and many were being treated at Wazir Akbar Khan hospital. The shooting started early Sunday morning and carried on throughout the day as hundreds of supporters drove in convoys of vehicles through the streets – firing off both light and heavy weapons. Footage posted on social media shows that among the Massoud supporters were heavily armed teenagers. 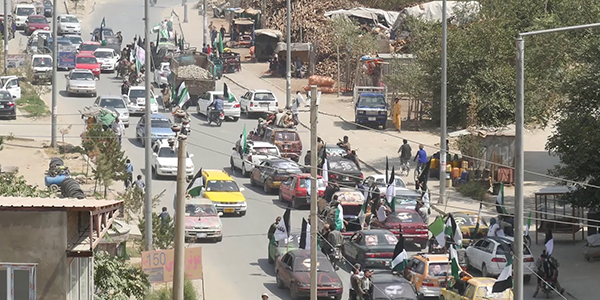 Footage also shows government vehicles, with tinted-windows, being driven by Massoud supporters through the city. Shops in the city center were closed, and many streets were deserted as Kabul residents said they were too afraid to leave their homes. Eyewitnesses reported that security forces did nothing to stop the convoys. “I saw a convoy drive past the check point close to the Abdurahman mosque near the Presidential Palace. As they passed, the supporters were shooting in the air. Security forces were just sitting there on chairs and did not react at all,” Rajab, a Kabul resident told TOLOnews.com. 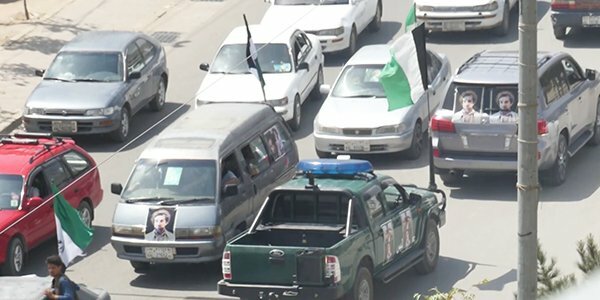 Another Kabul resident, Hayatullah, told TOLOnews.com that he had been on his way to work when a convoy was stopped in the Deh Afghanan area in the city. According to him, the Massoud supporters continuously fired into the air while security forces stood by and watched. He said that a few pedestrians, including himself, women and children, ran for a pedestrian subway, to take cover – where they waited for about 15 minutes until the shooting eased off as the convoy left the area. Another resident, Syed Zabiullah, was also vocal about the chaos in the city and said security forces had been “spectators” to the bedlam. “When I saw Massoud supporters freely shooting into the air today, while security forces sat and watched like spectators, it brought back memories of the civil war. Security forces just sat and watched a convoy of supporters driving through Deh Afghanan area and past the ministry of education and in front of Kabul University. 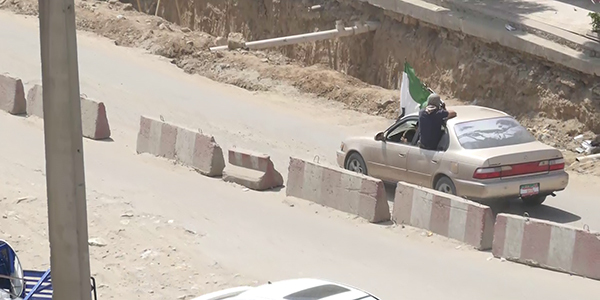 Youngsters, who were supporters of Massoud, were riding on cars and were shooting randomly. “People they passed were running to find cover. “This is not a civilized commemoration of a resistance icon, it just adds more pain to this wounded nation. I don’t understand where is the Kabul police and Kabul garrison, I think some politicians are encouraging these youngsters to resort to such violent moves. “It must be stopped. Enough is enough, rule of law must be put into practice. Commemorations do not mean military blockades of Kabul and shootings,” said Zabiullah. Dozens more slammed security forces for not having been able to control the situation. "Instead of driving around the city and shooting, these supporters should be holding prayer ceremonies and being charitable to the people,” said Ahmad Jawed, a Kabul resident. Victims of the chaos, also lashed out and criticized Massoud supporters for their reckless behavior. "A bullet was fired and it smashed into my leg. Other people were also shot in their legs," said one victim, Omid. Omid’s brother, Zabihullah, implied that it had been organized chaos. "They might have been given weapons, pistols and money (by some people)." The National Unity Government’s CEO Abdullah Abdullah also condemned the shooting and chaos caused by Massoud supporters – and said such actions were not in the spirit of what Massoud stood for. Massoud’s son and relatives also distanced themselves from the chaos and said such behavior was unacceptable. “If we are alive next year, we should take flowers to people's houses to mark this day,” said former president Hamid Karzai. Massoud was assassinated by two suicide bombers posing as journalists 17 years ago. Ahmad Shah Massoud, son of Colonel Dost Mohammad Khan, was born in Jangalak area in Panjshir district in September 1953. He spent his childhood in Panjshir and started school at the age of five. As a young boy he moved to Herat with his family and then to Kabul where he continued his studies. Massoud enrolled at the Polytechnic University in Kabul in 1973 and at the same time received membership of the Nahzat Islami Afghanistan party. Two years later, in 1975, he led the first rebellion of Panjshir residents against the government of that time. Ahmad Shah Massoud was assassinated in a suicide bombing in Khajwa Bahawuddin district in Takhar in September 2001. The anniversary of Massoud’s death is marked annually on 9 September in the country. The public health ministry said at least 20 people were wounded in Sunday’s unchecked shooting spree by Massoud supporters.